Harnesses save workers after crane collapse. Having seen an unrestrained operator launched when he bumped one up a kerb, thankfully only a broken arm not skull/back, why would anyone not harness up? While those guys got whipped around quite a bit, I actually found this GIF reassuring. 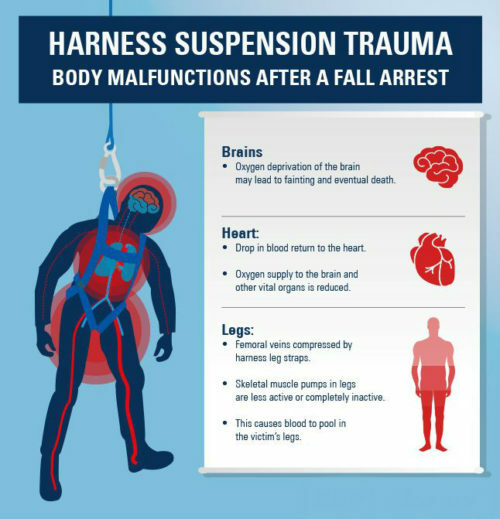 I also found something called Harness Hang Syndrome, or more formally: Suspension Trauma. If you're suspended from a harness for a long enough time (as little as 15 minutes), you'll faint. And fainting while being suspended vertically increases the risk of a certain type of cerebral hypoxia, which deprives your brain of oxygen, and can kill you. This is addressed with something called "trauma straps". 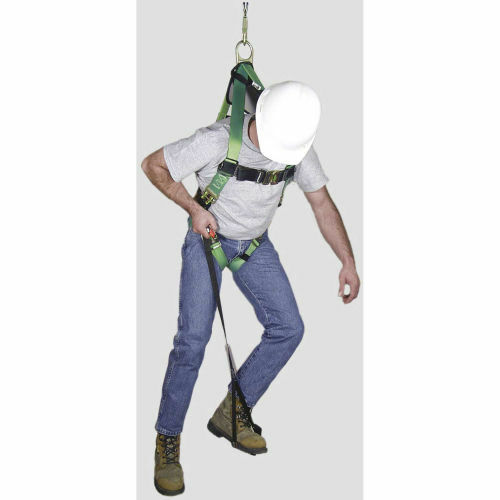 These are essentially additional straps attached to a harness, that allow a suspended worker to push against the straps with his feet, to assume a standing position. I would never have guessed . A bit like a slow hanging. Wonder how many suffered before realisation of the effects. That is why fall protection training is important before just strapping on a harness and going up high. The other important thing is have a plan for what to do if there is a fall and how to rescue the person who is hanging there. I attended a training session given by a guy who was in charge of the guys doing the setup/teardown for events in a large event center. Those guys walk-the-beam in the event hall... Large I-beams for the ceiling that are 35 feet off the ground. They had safety cable strung up there for tie-off, they did extensive training for walking the beam, how to rescue a guy, and had quite a plan and equipment for doing it. It was quite educational. If you do have to do something that's up high, take the time to get some training and get the right equipment, its worth it. I bought a tub pallet of them at an auction the bid was cheap enough so even if I couldn't resale them to a contractor I knew then I could always deploy them and use them as straps for other things. Another safety harness save, preceded by some sort of electrical fire.